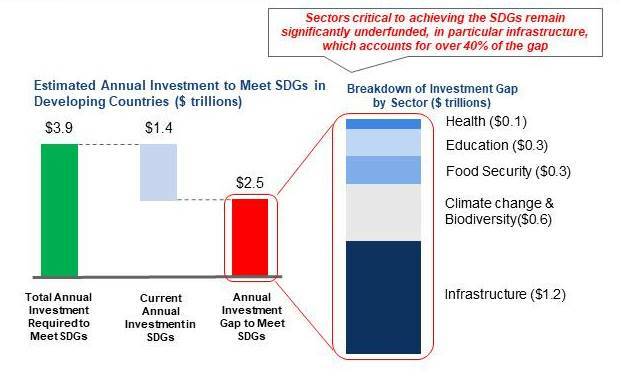 The financing gap to achieve the United Nations Sustainable Development Goals (SDGs) in developing countries is estimated to be US$2.5 trillion per year, of which climate-resilient and sustainable infrastructure accounts for the largest gap in funding*. Traditional sources of funding are insufficient to meet these goals, requiring innovative financing approaches to attract new sources of capital. Launched at the UN Conference on Financing for Development in July 2015 in Addis Ababa, the goal of SDIP is to mobilize the use of blended finance in sustainable investments in developing countries. *Adapted from UNCTAD, World Investment Report 2014. Current annual investment of US$1.4 trillion includes both public and private investments, defined as capital expenditures. The estimated annual investment gap is based on the average of the low and high estimates. © World Economic Forum, 2019 – All rights reserved.